THE SHOW: Grammy elected and recent Blues Hall of Fame inductee, Australian blues artist Michael Charles will claim the stage and embrace you with an elevated level of energy and a guitar driven journey through thirty four years and thirty four releases of his original music. Leading off with an explosive blues number, the audience is soon captivated by well-rehearsed precision experiencing MC's original blues, blues based rock, inspiring ballads, as well as some well-known covers. As in all of Michael Charles' performances and recordings his guitar is kept forefront and is the driving force behind his music! Michael Charles musical pilgrimage started over five decades ago in his birth place Melbourne, Australia. While enjoying a successful musical crusade of touring, recording, and numerous television and radio appearances in his homeland, Michael received an invitation from Buddy Guy's management to appear at the infamous Legends in Chicago, Illinois USA. Graciously accepting the honor, Michael Charles traveled the twelve thousand five hundred miles and took the stage with Mr. Buddy Guy. Through the next twenty years, and now a eight times Grammy elected artist, Michael Charles enjoyed being featured in numerous television and radio broadcasts and several music magazines. In October of 2015 Michael Charles received the extreme honor of an induction into the Blues Hall of Fame. Michael has received endorsements from Vertex and LR Baggs and in Canada from Godin / Seagull Guitars. 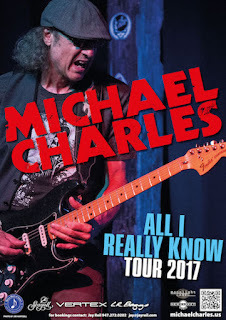 Michael Charles' discography is comprised of thirty-four releases including a double CD thirty year anthology released in 2014 and the live CD "Concert at the Nest", released in the winter of 2015. In 2016 Australian film producer started work on a documentary chronicling the musical career of Michael Charles. The DVD will be released in spring of 2018. At this time Michael Charles is traveling his tenth consecutive tour in 2017, the All I Really Know Tour, which will once again take him to the far corners of the USA, Canada, and Australia. The 2017 Tour promises a multitude of concerts and publicity appearances as MC performs a whole new list of cities, festivals, and nightspots and revisits some favorite venues from the last nine annual tours.